Major sporting events in Papua New Guinea are rare and something to be cherished. Little wonder then, that there is an infectious level of enthusiasm and raw excitement in Port Moresby ahead of Sunday’s opening to the FIFA U-20 Women’s World Cup. The PNG squad includes players from various regions of a nation that is made up of eye-catching coastal areas, rugged terrain mountain regions and a seemingly endless list of islands scattered around the mainland. That the squad is so geographically diverse is not as simple as it sounds. Papua New Guinea’s population is spread across the various remote regions of the country, and many centres are only reachable either by air or arduous road journeys. For the key cast members - the Papua New Guinea players – this is a particularly unique moment. But two players in particular - Nicollete Ageva and Joy Tsuga - have endured an atypical route to be part of a landmark moment in Papua New Guinea’s history. Both have a connection to Bougainville, the once strife-torn island region in the north of country. Ageva was kicking around a football with school friends when her life took a sudden twist, one that was as unlikely as it was serendipitous. The tall free-running forward caught the eye of a Just Play coach – OFC’s football development programme – and was recommended for a trial with the national squad. That was a little over a year ago, and much has since changed for the shy 18-year-old. Ageva impressed the national team coach – former NWSL coach Lisa Cole – at the PNGFA training centre in Goroka. Now she finds herself front and centre as humble Papua New Guinea open the tournament against Brazil’s mighty reputation on the pristine John Guise Stadium surface. That rough-hewn pitch back home could barely be further away, both figuratively and literally. Midfielder Tsuga also has family in Bougainville, having lived there for a few years, though she mostly grew up in Port Moresby. 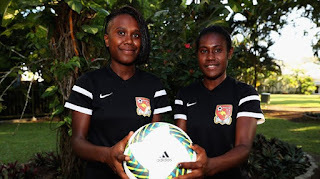 Tsuga comes from genuine footballing stock – her father was a referee inspector for the Port Moresby FA and brother was also an enthusiastic player. Tragically, however, both passed away in recent years, the latter due to a car accident. “Losing two family members is a very hard thing. It is always in my heart,” said a clearly emotional Tsuga, who also has two proud footballing sisters. “My youngest brother doesn’t play, but maybe when he grows up more he will get some sense into his brain,” Tsuga adds as the smile returns to her face. One gets the impression the diminutive midfielder has the right kind of heart for a special challenge. For these young players, the wait for the world to come to Papua New Guinea seemed interminable. “It feels different now,” Tsuga says “It is real finally. We have been training for so long. Time was ticking and ticking and we are like ‘when is this thing going to come’. When we arrived and we saw all the security and everything (tournament activity), we have never seen this sort of thing before in Papua New Guinea. This will never go away from our minds.